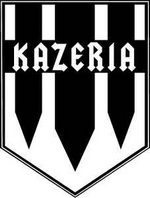 KAZERIA began its activities on 2008. Its name is a distorted way to write the word "hunting" in Spanish, and it's used as a sign of counter-culture. Hunting is one of the most dramatic and intense experiences in life: an act of survival, and also a spiritual quest. In ancient cultures, hunters are involved with arts and they celebrate rites about hunting. On the same sense KAZERIA incarnates intense and complex aesthetic full of epic visions, esoteric subjects and the occult, through sounds of rise, glory and decadence of past and brighter ages.